Six pictures from six different books (series). One word goes in each picture. 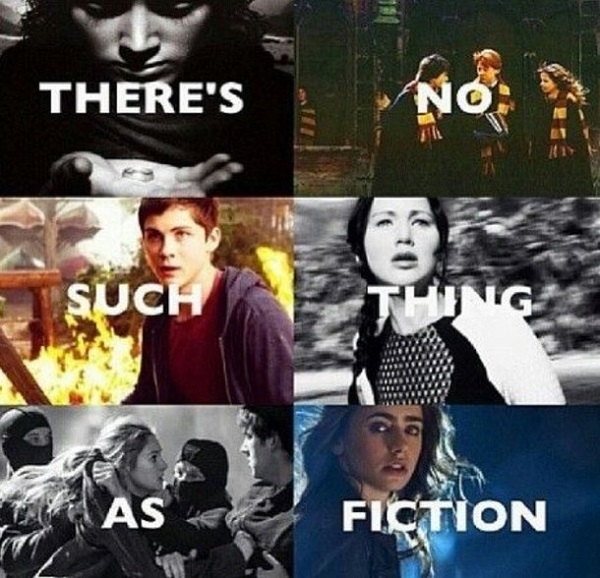 Words for each picture: There's / no / such / thing / as / fiction. Not quite falling within the parameters of Magical Merge -- in a way. 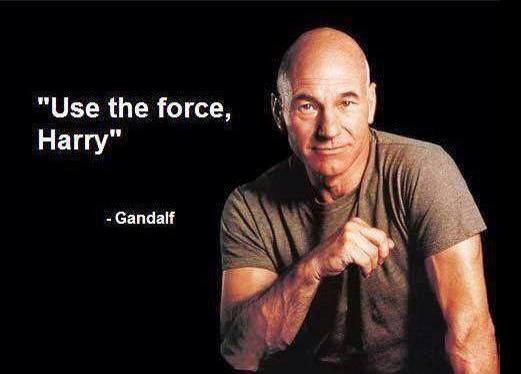 And yet, in a way, it's all magic. Graphic shows Snoopy sitting on his dog house roof, flying it as if it is an aeroplane. The dog house is coloured after the Tardis (Tardis blue and the roof has the windows and says "Police Box" on it). Snoopy is wearing his flying helmet and scarf. 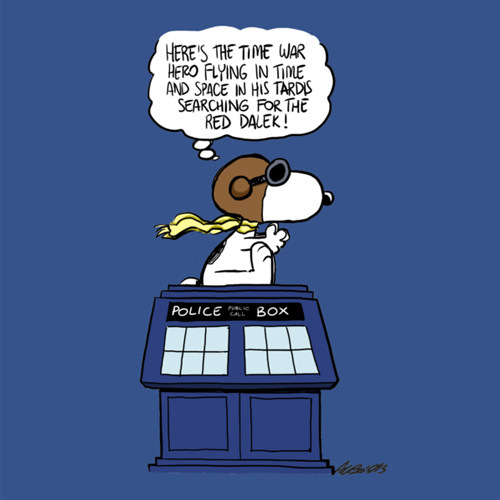 Thought bubble has this: "Here's the Time War hero flying in time and space in his Tardis searching for the Red Dalek." Graphic shows three pictures stacked on each other. Top frame - Edward Cullen saying "Merlin's beard, Cho!" 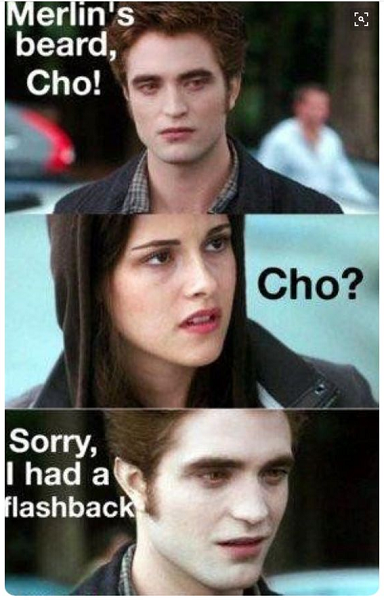 Second frame - Bella Swan saying "Cho?". Third frame - Edward Cullen saying "Sorry, I had a flashback." Graphic shows pictures of four women from four different book series. Each picture has a word, in caps, to the side of the woman. 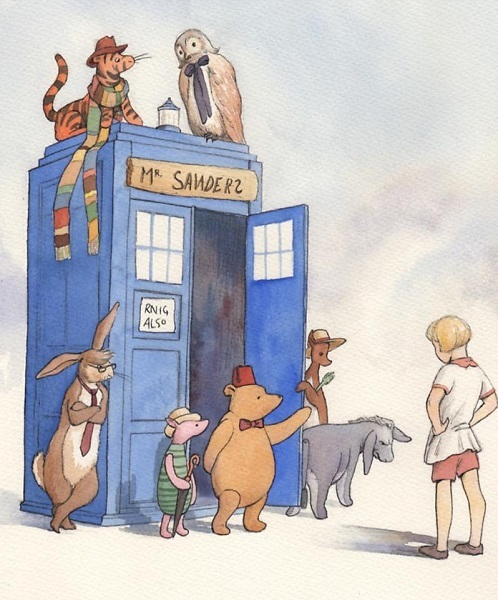 Graphic shows a Doctor Who / Winnie The Pooh mash up. The Tardis has sign 'RNIG ALSO' at the phone box door. Instead of "POLICE Public Call BOX" it shows "Mr. Sanders" and the various peoples of Winnie the Pooh are present, many attired with or holding different indications of The Doctor - celery, long scarf, bow tie, fez, hat, umbrella. 2 - Would you like to come to our house for dinner? 3 - Charlie says "Harry Potter" is a fictitious character. 4 - Sally crumples up the paper and tosses it over her shoulder. "Some other time, Harry.."
Graphic has black background. It shows - left side of image, with white letters " "Use the force, Harry" - Gandalf "
First (top) part - the control room of Hunger Games. A technician - "We've lost power!" White-haired man (President Snow) "To the entire arena?" Technician - "All of it, Sir." 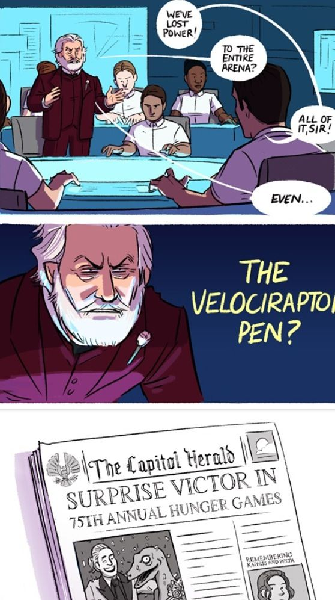 White-haired man - "Even..."
Middle frame - White haired man leaning forward "The Velocirapto [Velociraptor] pen?" Bottom frame - Newspaper (The Capitol Herald) with headline: "Surprise Victor in the 75th Hunger Games!" with picture of the announcer (Caesar Flickerman) beaming at a smiling velociraptor. Image is of the Winter Soldier (on the left) appearing to be facing off with Newt Scamander (right). The Winter Soldier has his left arm raised towards Newt, and Newt has his wand raised ready for action. 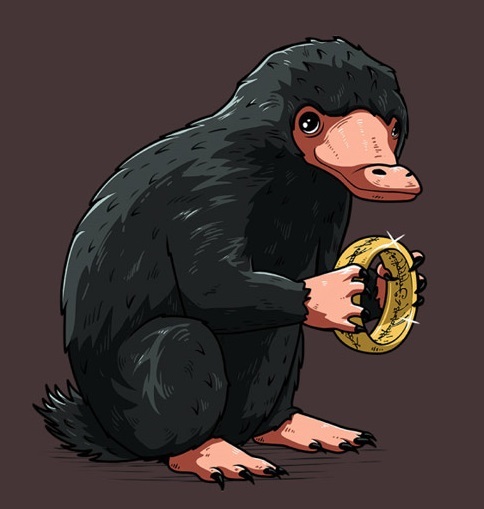 However, a Niffler is wrapped around and hanging on to the shiny of the Winter Soldier's arm ... and Bucky is looking at it and trying to shake it off. panel 1 - Edward Cullen looking at Bella Swan (who is facing away from him). She says "I know what you are." panel 2 - He looks intently at her (she is still turned away) and says "Say it. Out loud. Say it." panel 3 - Picture just shows her, and it's as if she turned towards him some. 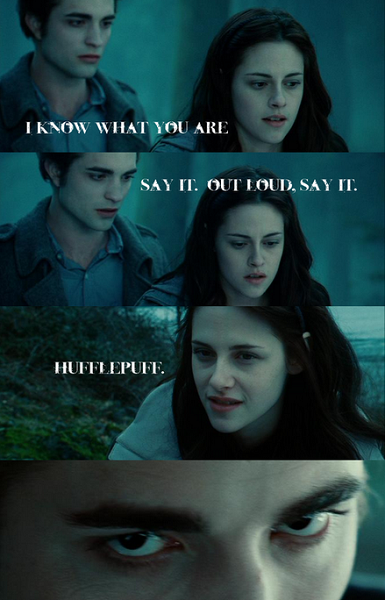 "Hufflepuff." panel 4 - looking down at close-up of Edward Cullen, just eyes, heavy eyebrows and forehead, staring into camera. In top 3/4 - picture of Bartemius Crouch Junior on left side and the 10th Doctor (Doctor Who) right side. 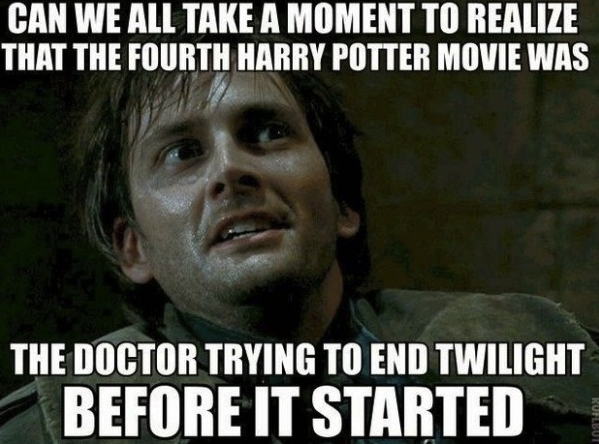 Barty Crouch Jr. died in a chapter called "The Parting of the Ways" in the Harry Potter books. The Tenth Doctor first appeared in the episode "The Parting of the Ways" of Doctor Who. 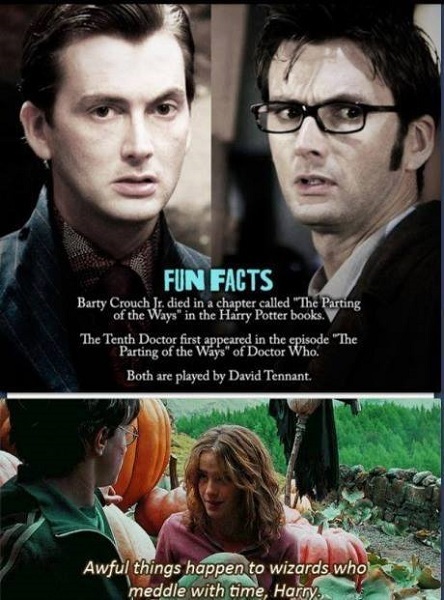 Both are played by David Tennant. Bottom 4th of page is screen cap of Hermione Granger and Harry Potter in Hagrid's pumpkin patch. She is telling Harry "Awful things happen to wizards who meddle with time, Harry." -- At top, with Harry Potter font and in gold - "My Patronus is a"
-- at bottom, Star Wars font and in gold - "WOOKIEE" "